Canon G7X and Panasonic LX100 are two mirrorless digital cameras with fixed, non-interchangeable lenses, available in a similar price range. Both products are made by big names of the industry. You certainly have heard a lot about Canon as well as Panasonic. Those two companies have been trusted by many since a long time ago because they keep high standards for their products. Now, in choosing between Canon G7X and Panasonic LX100, you need to be aware that each of the two models comes with different strengths. Let’s see them all below! 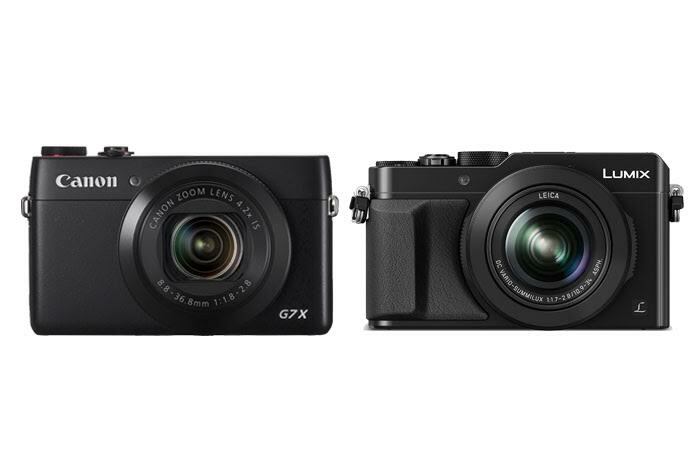 Honestly, in terms of design, Canon G7X holds a slightly better edge than Panasonic LX100. This is because Canon G7X combines both touchscreen control and dial control for the quickest, most intuitive operation ever. It is very easy to handle, and you can access its various functions and features effortlessly. Furthermore, Canon G7X also sports a 3.0-inch tiltable screen which allows for a great deal of flexible and versatile shooting angle. Oh, well, you can even take selfies with it. On the other hand, Panasonic LX100 comes with button and dial controls. The 3.0-inch display screen is fixed. Anyhow, the camera looks very cool nonetheless. The textured gripping area not only enhances the premium aura that the camera emits, but also promotes solid and firm handling. Plus, Panasonic LX100 comes with a built-in electronic viewfinder. Have a look : Canon G7X vs SX710. Take note that these two cameras have very different image sensors. Canon G7X boasts a 20MP 1.0” BSI CMOS sensor that can effortlessly capture large-sized images with high-resolution settings. On the other hand, Panasonic LX100 is armed with a 13MP 4/3” CMOS sensor. So, be careful if you are planning to print your shots as large-sized photos. Nevertheless, they both have exceptional color quality. The colors are vibrant and vivid. In terms of features, though, Panasonic LX100 holds the better edge. It boasts much higher maximum shutter speed and ISO. While Canon G7X is pretty cool with 12800 max ISO and 1/2000s max shutter speed, Panasonic LX100 is totally in another class, featuring 25600 max ISO and 1/16000s max shutter speed. In addition, it also comes with a more powerful AF system and AE Bracketing, too. And, also worth a note, Panasonic LX100 already supports 4K Ultra HD video recording, as opposed to Canon G7X’s 1080p Full HD video recording. In general, Panasonic LX100 makes the best way to go. It is much more powerful, and the built-in electronic viewfinder also promotes better framing and control. However, if you really, really need high-resolution settings, then Canon G7X makes an excellent alternative.